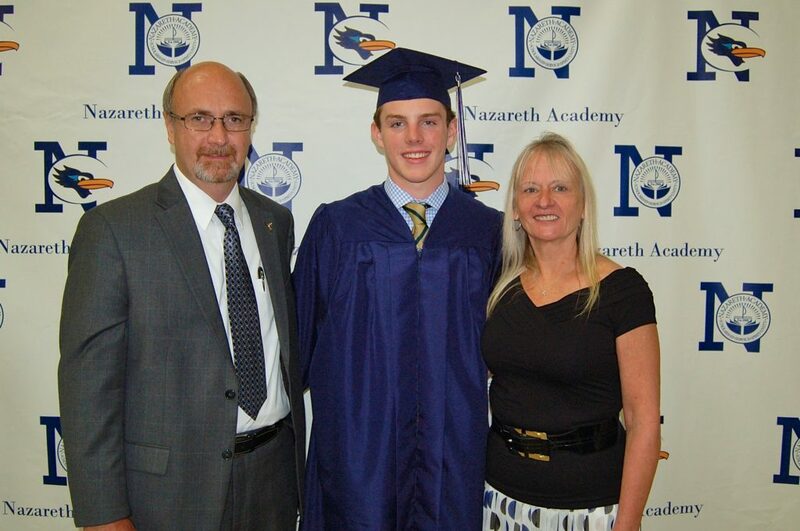 We are honored to be here to present the Kelli Joy O’Laughlin Memorial Scholarship to a deserving Nazareth Academy student. Our daughter, Kelli sought and achieved a true balance in her life. She loved sports, especially tennis and running and worked hard in school to achieve success. Outside school and sports she was very focused, even at such a young age, on giving back to the world around her and just being kind to others. This year’s recipient of the Kelli Joy O’Laughlin Memorial Scholarship reflects that similar balance, between giving of oneself in school and sports and giving to others. This recipient certainly meets — and exceeds — the standards for the scholarship. Like Kelli, he worked hard to do well in the classroom, and also made a mark in athletics. In addition to his physical skills on the football, wrestling and Lacrosse teams, he demonstrated leadership on the field and on the mat: he was recognized with a Service / Leadership award for football and a Sportsmanship award for Lacrosse. In his essay, he talked about how his interest in helping others has influenced his leadership and participation in team sports. “I always try to tell unrecognized team members how hard they are working” This resonated with us, because Kelli was known for extending a helping hand to others who weren’t recognized and for standing up for others who were being put down or made to feel badly about themselves. He also wrote about how he receives no greater reward than the satisfaction of having a positive impact on others. We are please today to give him THIS scholarship award that really does reward such unselfish, kind and thoughtful ways of thinking and acting. Congratulations, you embody what your Kelli Joy stood for and her legacy going forward into the world. John and I are pleased to award this scholarship in Kelli’s name to Thomas Patrick Harrington (Tom Harrington). Link to post about the 2014 Scholarship Presented to LTHS Students.